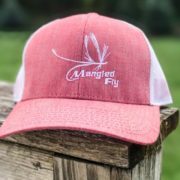 Joe Custer with his lucky Mangled Fly Swing Hat ( will be restocking this item soon!) 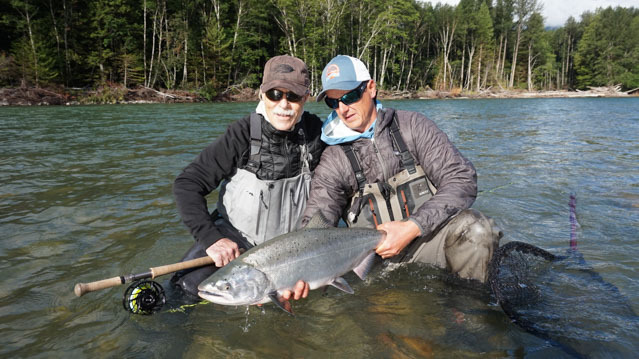 sent in this pic from a recent trip to BC staying at the Dean lodge at BCWest with Deneki Outdoors. If this trip interests you contact Kara Knight is lodge manager. Shane McKay is head guide and in the picture with Joe. 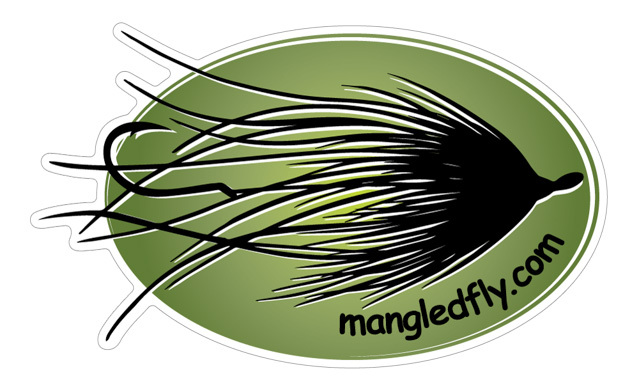 Have a new sticker, from our popular Swing Fly logo from last fall had a few requests for a sticker. 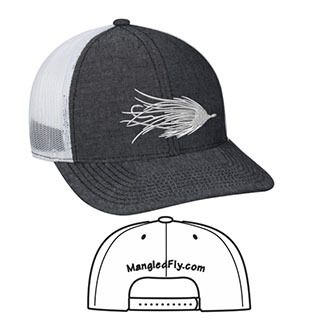 Now you can add the Mangled Fly Swing logo to your favorite cooler, truck window, or coffee mug. Same great quality as the rest of our stickers. Check it out and get yours today. A couple impressive fish from a few Mangled Fly customers. 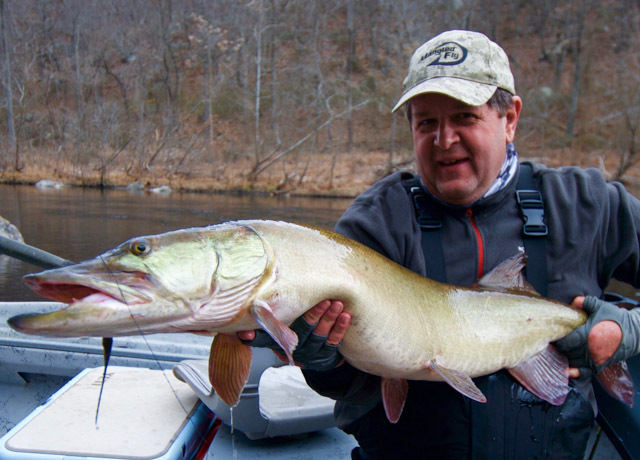 First is Bob H. who was fishing with world famous Muskie Guide Blane Chocklett and scores a dandy muskie on the fly. Nice work Bob! Bob wearing one of the old school Digital Camo Hats with the old hook logo. Great to see the hat is doing you well! 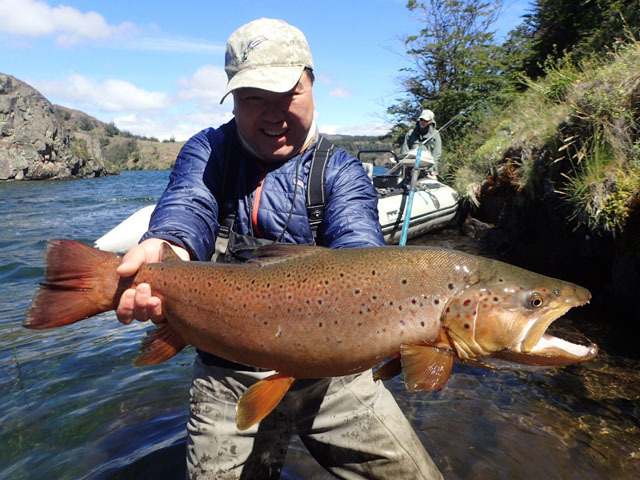 Kean also sent in this impressive trout pic from his latest journey to Chile. 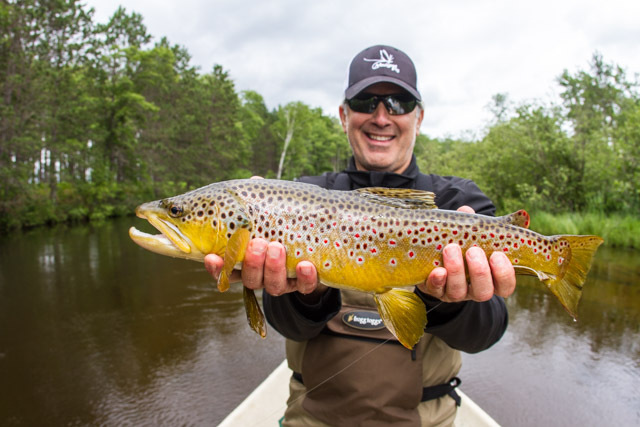 Kean who has always been a believer in the power of the Digital Camo Hat scores another impressive trout while wearing his lucky charm. Great fish Kean! 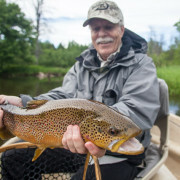 Fish was caught on a circus peanut we tied for Kean, with a special blend of southern hemisphere colors. Have add another hat to the arsenal , wanted a wax cotton type hat for the cool wet fall days of fall. After wearing this hat for a few days during 2 of the wettest days of the fall . The new Dri Duck Mangled Fly Hat is a keeper. This hat dries really fast, and keeps you fairly dry during the wettest of days. 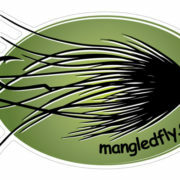 As the new Mangled Fly Swing Fly Logo on the front. First need to apologize for the lack on content, nothing but excuses but hope to find some time and create some interesting content in the coming weeks. Here are a few images to help scratch the itch. 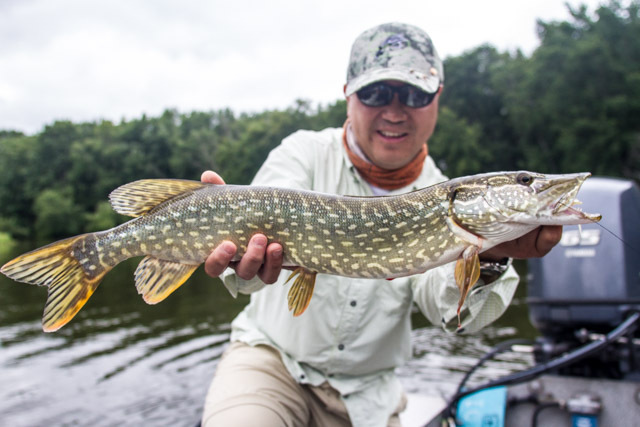 Kean hunting his first Pike on the fly, it was pretty exciting to watch this predator hunt down our dying bait fish pattern. Using the Scientific Anglers Intermediate Titan Taper with a Essox Leader we had a few chances at Pike and caught multiple nice smallmouth bass on the Manistee River this past weekend. Jerome joined me for a day time adventure and scored some really nice trout on dry flies, Jerome has to believe in the good luck his new Mangled Fly hat provided him. 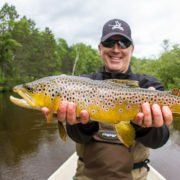 Great day Jerome and impressive trout on the dry fly during the day. Had a chance to spend a few days along the west coast on a family vacation and shot this sunset picture. Always impressed by the size of Lake Michigan and how much it reminds me of the east coast. Just missing a little bit of salt. 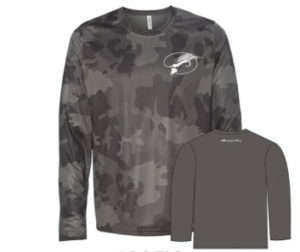 Next week a New long sleeve Sun shirt will be hitting the store. Thank you Kean Oh for letting us use one of your amazing drawings. 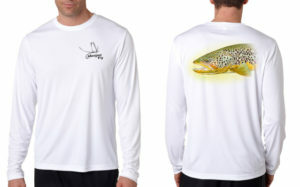 A beautiful Michigan Brown Trout on the back, in stunning 8 color design, with the Dry Fly Mangled Fly Logo on the front. 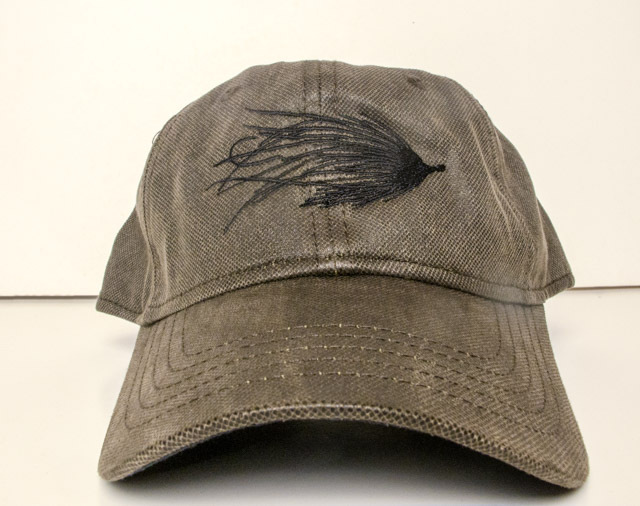 Same Logo as our Dry Fly Hat that came out last week. 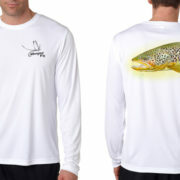 This long sleeve shirt will be printed on one of the nicest Sun Shirts that I’ve ever worn. 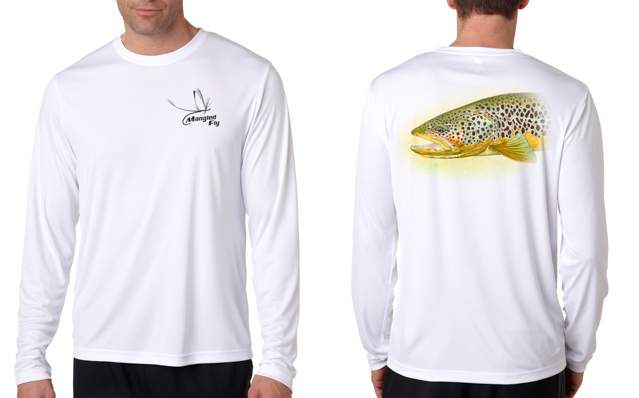 The Long Sleeve Sun Shirt has been a staple of my day to day wardrobe since they first started coming out. This particular one is made my Hanes and is the most comfortable one to date. I’ll post another blog when they arrive but wanted to share the image. Limited addition so get them while they last. Bob H. sent in this great picture of his adventure with Blane Chocklett, Bob was hoping to muskie fish with Blane. 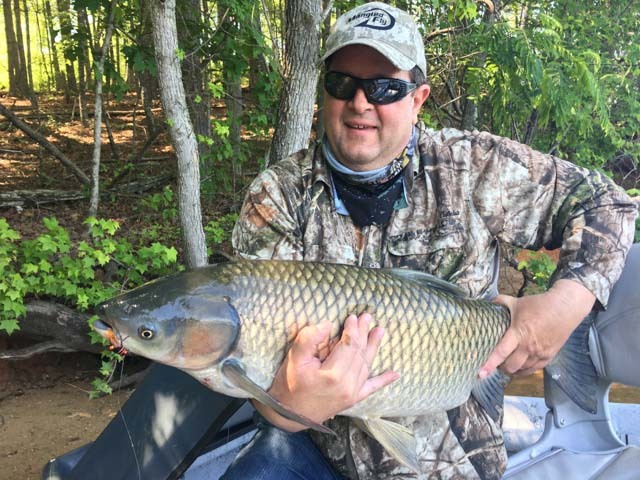 But with water so high Blane suggested that they go after Carp and Grass Carp on topwater with Cicada Patterns. 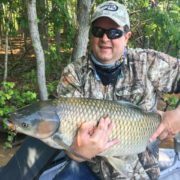 Bob had a great time and landed some impressive sized carp on the fly. 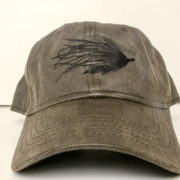 Bob thank you for the picture and support wearing the Mangled Fly Camo Hat. Below is a video posted recently with more Highlights of what Blane does on the fly and the impressive amount of Cicadas currently invading his area. Cicadapocalypse 2017 from Drift Media Productions on Vimeo.